For my inaugural posting, I’d like to bring up a health challenge that I see frequently within my practice – magnesium deficiency! 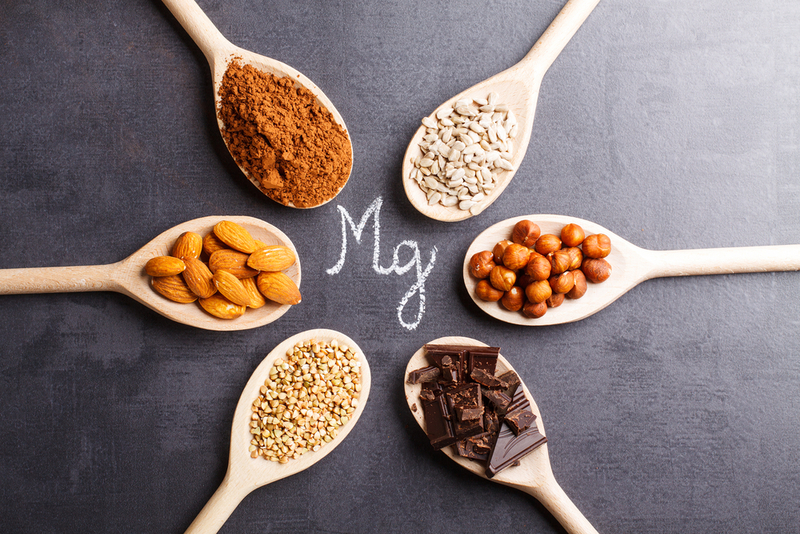 You may have heard from others, “Oh, you should be on magnesium!”, or “My husband/wife/brother/cousin/second-aunt-twice-removed started taking magnesium and felt so much better!” You might then ask yourself, “But why?” A good question, to be sure. So what does magnesium do for you that’s so important to warrant such attention? For starters, I would argue that magnesium is the most important mineral we have in our bodies. Not to diminish the importance of other minerals (calcium, chromium, zinc, etc. ), however magnesium is involved in the greatest number of reactions in the body, ranging from muscle relaxation to production of energy at a cellular level, thereby allowing our bodies to function properly. Over 300 enzymatic reactions critical for our bodies require it(1). As a population, not just in Canada but North America, magnesium deficiency is quite common. In my practice, this has been confirmed with many laboratory tests on a number of patients over the years. Not all forms of magnesium are created equally, and not all compounds that magnesium may be bound to behave the same within our bodies. Additionally, different forms of magnesium compounds can absorb differently(6), meaning that what you might be picking up off the shelf may or may not be the best choice for you. It is important to understand, and consult with a qualified healthcare practitioner, about these different forms, how they absorb, and how they operate. And of course, ensure that you’re properly tested. Knowing where your magnesium levels are at, and how much you may require, is certainly an important piece of health knowledge. Typically, magnesium deficiency can easily be treated and magnesium can be replenished by mouth (through foods, quality supplements, etc.) However, magnesium can also be infused intravenously when required, allowing for rapid replenishment while bypassing absorption through the gastrointestinal tract. When magnesium levels are significantly low, intravenous therapy may be a superior choice vs. the oral route. Such situations may include long period of time to adequately replenish levels, certain health challenges that result in diminished capacity to absorb magnesium from the gut, or conditions that may result in increased loss of magnesium from the body beyond the normal rate. Magnesium is an important nutrient, and an important piece of the puzzle in our overall health picture. Hopefully, reading this has helped you to appreciate this little macro-mineral as much as I do, and that it contributes to your overall health and well-being! More information on how Magensium IV Therapy can help, view our IV Page here. 1 Jahnen-Dechent, W. and M. Ketteler. “Magnesium Basics”. Clinical Kidney Journal 5.Suppl 1 (2012): i3-i14. Web. 8 May 2016. 2 Murray, Michael T and Joseph E Pizzorno. Encyclopedia Of Natural Medicine. Rocklin, CA: Prima Pub., 1998. 367-368, 462, 502-504, 660-661. Print. 3 Mauskop A, et al. “Intravenous Magnesium Sulfate Rapidly Alleviates Headaches Of Various Types. – Pubmed – NCBI”. Ncbi.nlm.nih.gov. N.p., 2016. Web. 8 May 2016. 4 D’Angelo, E K, H A Singer, and C M Rembold. “Magnesium Relaxes Arterial Smooth Muscle By Decreasing Intracellular Ca2+ Without Changing Intracellular Mg2+.”. Journal of Clinical Investigation 89.6 (1992): 1988-1994. Web. 2 May 2016. 5 Smith GA, et al. “The Effect Of Mg2+ On Cardiac Muscle Function: Is Caatp The Substrate For Priming Myofibril Cross-Bridge Formation And Ca2+ Reuptake By The Sarcoplasmic reticulum? – Pubmed – NCBI”. Ncbi.nlm.nih.gov. N.p., 2016. Web. 2 May 2016. 6 Lindberg, J S et al. “Magnesium Bioavailability From Magnesium Citrate And Magnesium Oxide.”. Journal of the American College of Nutrition 9.1 (1990): 48-55. Web. 7 May 2016.